Ministry of Propaganda - 07/Feb/2005: "And the Winner is"
Seems I gave too many hints in yesterdays picture challenge. 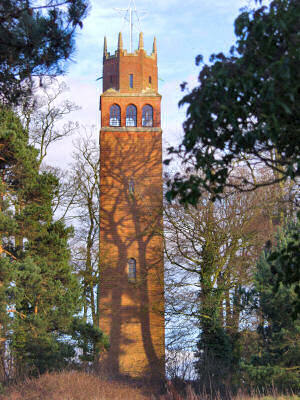 Matthew picked it up and gave a few more hints, which allowed Ugo Cei to quickly figure out that the building in question is the Faringdon Folly. The picture on the right is from a visit in January 2003. That's about all there is to say about it. It's a pretty much pointless tower in the middle of not very much (apart from lovely Faringdon. I better say that in case Matthew reads this). The view is probably quite nice on a clear day, if I get a chance I'll try to create a QuickTime CR panorama one day. The opening hours are a bit erratic and not very frequent either, so it might take a while until it all works out. If ever. Now I'll better find a more difficult picture for the next challenge.